Travelling to Europe for the First Time? We Live Here – We Can Help! Ah, Europe. A continent full of awesome things to see and do. It’s big, diverse, fascinating, and scary – if you’ve never been before! From planning your first trip to Europe to crossing items off your “traveling to Europe” checklist, it’s very normal to be nervous about your trip to Europe! We were all there – well, at least Eric was. Lisa was born here so she’s always felt pretty comfortable! These days, our resume for Europe is pretty extensive. Lisa is German so that’s pretty important. Eric has been to over 30 countries in Europe – and we’ve both lived, studied, and travelled in countries around Europe. Let’s be serious – we currently live in Europe! We’ve planned and done multiple Europe trip itineraries. Whether together the two of us, with friends, or even solo – we’ve crossed off a few must-see cities in Europe (Prague) as well as hidden gems (Albania) along the way. So, whether you are travelling to Europe for the first time by yourself, backpacking Europe, or on a family trip, this post is for you! 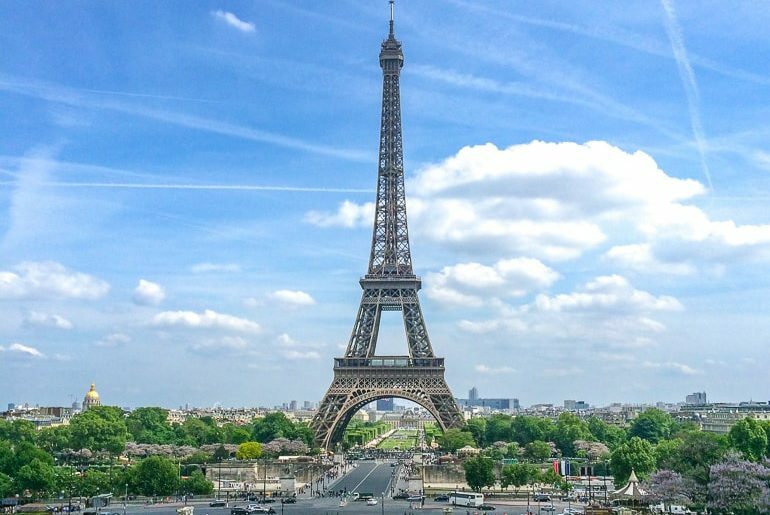 If you are travelling to Europe for the first time and/or are planning an awesome Europe trip itinerary, we have other posts that you might be interested in! A Classic “First Europe Trip” Itinerary – Eric’s first ever route! 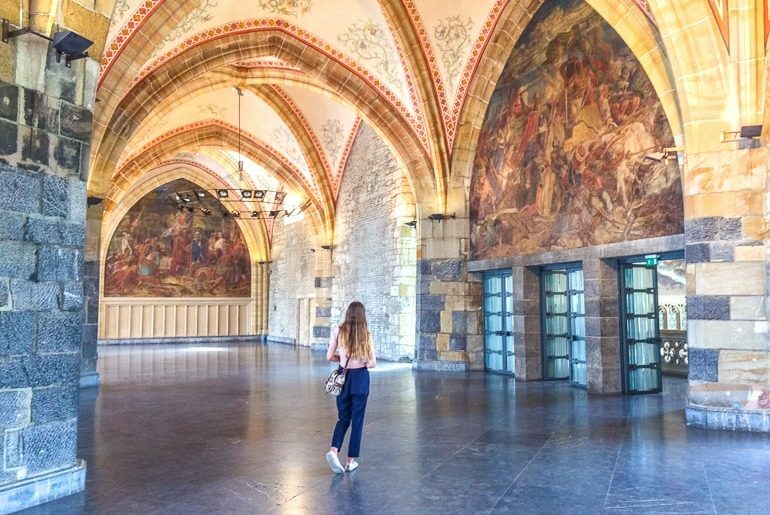 Lisa wandering through the historic City Hall in Aachen, Germany! It’s kind of hard to give general information about a continent but we thought it would be helpful. Europe is a continent made up of (approximately) 50 countries with a population of over 700 million people total. Europe is located in the Northern Hemisphere – meaning that, generally, summer is from May to August while winter is November to February. There are regional differences in temperature which we will get into in the next sections. There are a bunch of regions within Europe like Western Europe, Central, Eastern Europe – and sub-categories of countries/regions like the Baltics, the Balkans, Scandinavia, etc. There’s a ton of history to the continent, a ton of different cultures, traditions, and languages, too. Europe has dozens of languages spoken with German, Russian, Spanish, French, Italian, English, and a few others being the most common. In short, Europe is a large, diverse continent where every country is different. That’s what makes it so exciting to explore for the first time! The best time to travel to Europe is very dependent on the season, your budget, and what you want to do when you are there. The summer season (June-August) is generally when most countries are the warmest BUT the crowds can be quite large in the popular cities and capitals. Winter can be cheaper but colder – unless you are planning to ski in which case winter is the season for you! We suggest the shoulder seasons of April to mid-June and then September to the end of October for good prices, smaller crowds, and still nice weather. Obviously, that might not work if you only have summers off from work but it’s still something to consider! 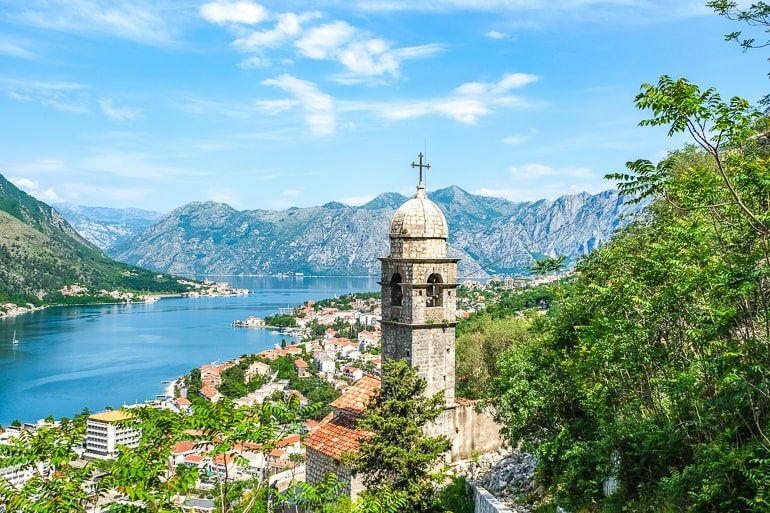 The hike in Kotor, Montenegro was SO hot but worth it! If you are travelling to Europe for the first time, climate and weather is something that will definitely dictate your travel plans. It’s good to know that there are lots of different climate zones in Europe. Even within these zones, you can get varying weather conditions. Generally speaking, the Nordic countries are the coldest but they can become warm and quite enjoyable in the summer months. We actually named our favourite Europe cities to visit in winter. The farther you go south towards the Mediterranean Sea, the warmer the weather gets. If you want popular places to check out that are good for the summer season, then countries like Croatia, Spain, Portugal, and Italy are good bets. That said, summer is popular so these places can get busy! If you want popular places to check out in the winter, we really love Denmark, Norway, and Iceland. Of course, you can visit these countries in the warmer seasons, as well – this is just a guide to when we really liked visiting these countries. When you are travelling to Europe, it’s important to keep in mind which passport you hold and which countries you are travelling to. Europe has a few different areas which require different visas to enter (or not). Most of continental Europe (but not all of the countries) are part of Schengen Zone. This zone is not the same as the European Union. The Schengen Zone is an area in Europe comprised of 26 countries that allow free movement between them once you have “entered the zone”. Most major non-European passports (Canadian, America, Australian, etc.) can stay in the Schengen Zone without a visa for up to 90 days within a span of 180 total days. So you’ll be fine if you only visit that part of Europe for a few weeks. However, countries in the Balkans, the United Kingdom, and Ireland, for example, all have a separate border to cross since they are not in the Schengen Zone. Also, always check the visa restrictions for your passport with your country’s government/embassy before leaving! If you need a visa for the Schengen Zone, you will have to apply beforehand for a “Schengen Visa”. A stop in Paris, France is always a good idea on a first Europe Trip! 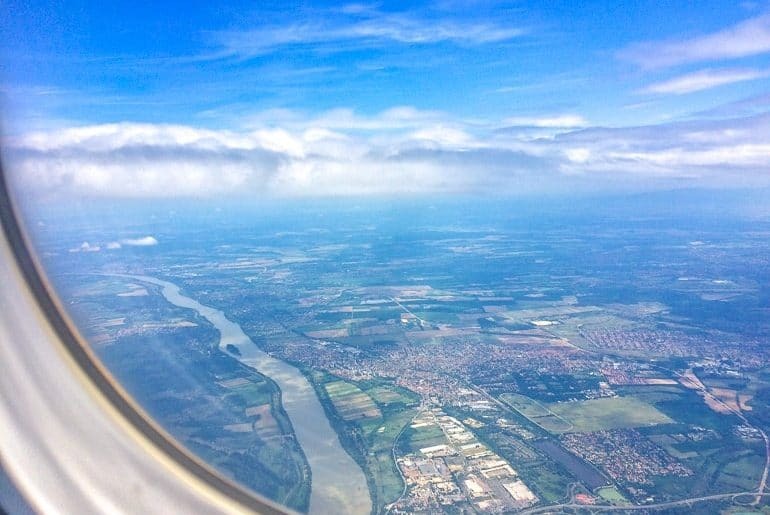 If you are planning your first Europe trip route, it’s easy to feel overwhelmed. There are just so many places to check out! The capital cities are always a popular place to start because they often times have the best sights, a big airport to fly into, and they are generally well connected to the rest of the country you want to explore. The capitals just make sense as a starting point for any new country. From there, you can always day trip to other places in the countryside or continue on your journey. Classic stops for the first trip to Europe are Paris (France), Berlin (Germany), Amsterdam (The Netherlands), Brussels (Belgium), Prague (Czech Republic), Budapest (Hungary), Rome (Italy), Vienna (Austria), London (United Kingdom), Barcelona (Spain), etc, etc, etc. As for itineraries around Europe, we’ve written a few down which you can check out. Eric travelled his classic Europe trip which might be a good place for you to start. We’ve also got an Eastern Europe itinerary for ideas of places to stop that are cheap and beautiful! If you want country-specific guides, check out our Spain itineraries, Croatia Itineraries, or Malta itineraries to get some ideas! 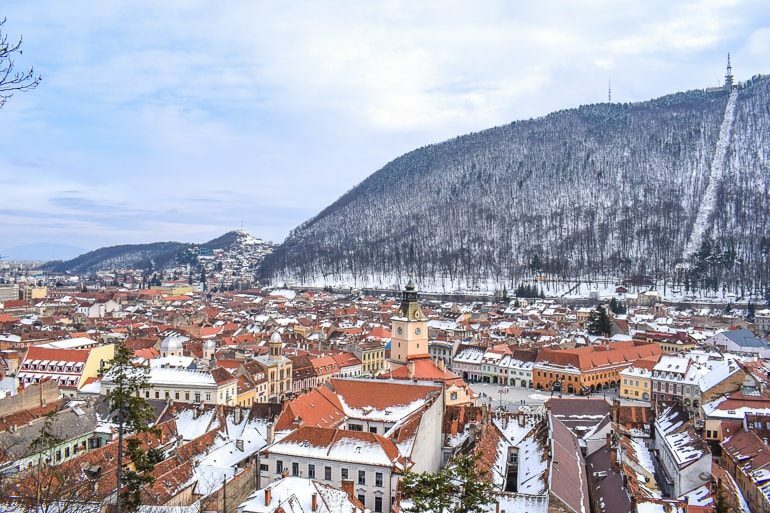 The medieval old town of Brasov, Romania shouldn’t be missed! There are more but we could go on forever naming currencies of the continent. We’ve used almost all the currencies at one point or another. It’s always fun to get a new one at the ATM in the country. Speaking of which, you can choose to take money out beforehand OR take it out from a local ATM once you are there – assuming your debit cards allows for international transactions. If you aren’t sure if you need cash, maybe wait a few hours and see how expensive things are and what form of payment is most accepted.As for using cash versus debit card versus credit card, every country is different. Some are advanced and use basically NO physical money (Sweden) while others still love their cash (Germany). Coming from North America (where we rely more and more on cards), it’s a safe bet to have cards with you but also keep some cash on you. Bigger shops, tourist places, and restaurants will usually accept credit card but supermarkets don’t always (Netherlands). Tipping in Europe is not mandatory like in North America BUT you can definitely tip for good/great service if the occasion calls for it. Common places to tip are in bars/cafes, at restaurants, hotels staff, and taxis. How much you tip depends on the total price and how great the service was. Usually, you can expect to tip around 5 – 10% of the total price – which is quite a bit lower if you are used to North American standards. If you’re travelling to Europe for the first time, you will definitely need to bring a travel adapter for your electronics. There’s a good chance you will have a phone and a camera – and maybe a tablet, e-reader, or computer with you. These will all need a charge sooner or later – and there are a few different plug shapes and voltages around Europe. Most modern electronics can handle the voltage change (North America wall plugs have 110V whereas Europe uses 220-240V) so that’s not really an issue anymore. Read the label of your charger cord for the electronics to see what it says. You WILL need a travel adapter to change the plug shape though. Most of continental Europe uses a two-prong plug classified as type C or E/F plug – that is the same in many European countries such as Germany, France, and Denmark. The UK, Malta, Ireland or Cyprus use Type G which is different from continental Europe. Most modern adapters will have both of these styles on them. We like the travel adapter below since it has the prongs you need AND since it comes with USB ports. Extra USB ports are great for charging phones, GoPros, and external batteries while you can still charge your big items all at the same time. The views from the plane are usually great in Europe! There are loads of ways to get around Europe once you are there. How you travel really depends on the places you are visiting, the length you are staying, your budget, and your personal preference! If you are coming to Europe from North America, consider a Europe stopover flight to see more places before you even get here! If you need to cover great distances, there are cheap flights available once you get to Europe. Flying everywhere is easy but not always the best call for the environment if you could also just take a train – but that’s for you to determine. We like to use Skyscanner to see which flight options are available. Budget airlines like WizzAir, WowAir, Easy Jet, Ryanair, Eurowings, and many more do “cheap hoppers”. However, you have to factor in the bus or train to get to the airport – usually, cheap airlines fly into airports that are farther from the centre of the city you are trying to check out. Flying adds another element to your trip: what you pack and HOW you pack it. If you are always flying and flying with carry-on luggage only, it means you cannot have large toiletries over 100ml in your carry-on luggage with you. If you check a bag each time then this is not an issue but with some airlines you have to pay extra for checked bags. Whereas if you had travelled “on the ground” the whole time, you could buy one bottle of body wash (for example) and use it the entire trip as you travelled around on buses or trains! Just something to think about. Europe is different from North America in the sense that you can take the trains basically everywhere. We love this about the continent. Canada is too reliant on cars since the distances between towns are just so great. 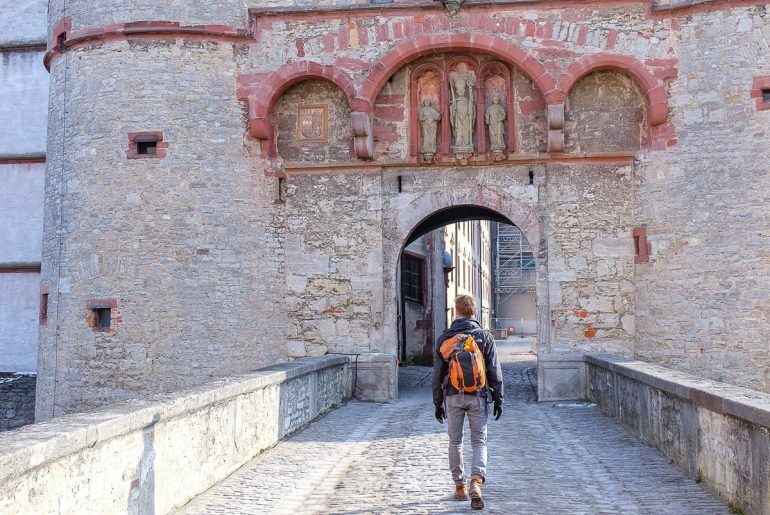 It means you can check out a “hidden gem” in Germany like Aschaffenburg and still get back to your base/apparent in, say, Frankfurt without hassle or the need for a car. You can use something like Rome2rio to help you plan ground transportation. It’s not perfect – but it gives you an idea of the possible connection and you can click through to websites to book. Another one is Omio (formerly GoEuro) – it’s a big search engine for booking transportation tickets. Being close to Germany, we use DB Bahn (the German train company) quite often. Their site even provides the schedules for trains in Romania (fun fact). The bus is another great option for getting around/between countries quickly and safely. We have taken buses through more countries than we can count at this point and generally had positive experiences. A great company to check out is Flixbus – it’s a brand you can trust for cheap fares and good service. We also have used MegaBus, but just in the United Kingdom. Getting around Europe by car is also a great idea. Having a car allows you to explore places/areas that you otherwise wouldn’t be able to get to using only public transport. Generally, the highway infrastructure is good in countries but it does vary. One thing you might need to consider is if YOU feel comfortable with driving in a foreign country. The lights and signs will be in different places – some might even be in a different language. These are things that can throw off your comfort zone compared to driving at home. Another thing to consider is the driving mentality of the people in the country. Of course, there are always good and bad drivers in all countries – but the further south you go (Italy, Spain, Malta) the drivers get a little “crazier”. Some drivers are very impatient (sorry, Malta – but it’s true). Another thing to consider is the driving side. Most of Europe drives on the right like in North America but the United Kingdom and Malta drive on the left so that can take some getting used to if you are coming from North America. As for renting a car, be sure to check if you can rent a vehicle with your licence from back home or if you also need an “international” driver’s licence attached to it. Eric has something that he got from CAA which verifies his licence for use in other countries. If you need a rental car, you can check here for rental prices from different companies. Always look into insurance before you rent, and always check the car before signing anything. 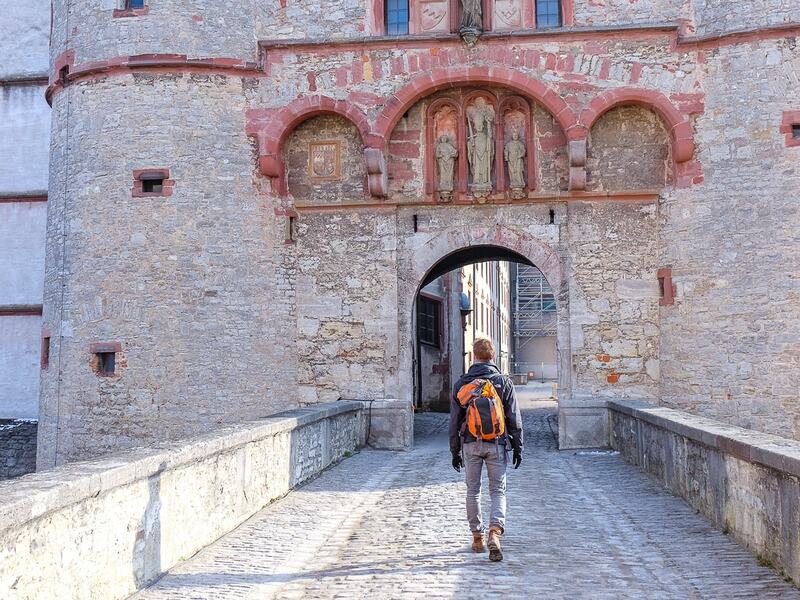 We didn’t stay at this Fortress in Würzburg, Germany – we wish! If you’re travelling to Europe, you are going to need a place to sleep! Luckily for you, there are loads of different options – from hotels and apartments, to guesthouses, hostels, and Airbnbs. We have stayed in a variety of different places over the years – and sometimes the destinations dictate the style of accommodation. For example, there are lots of “apartmani” in Dubrovnik, Croatia and Kotor, Montenegro whereas Budapest has loads of hotels and hostels. Just different places with different set-ups. We tend to stay in apartments since we typically stay in a place longer and we like to prepare our own food to eat healthy and to keep costs down. We usually book apartments on Booking.com. We did stay in Airbnbs but we are increasingly aware of the push back in many cities (Venice, Barcelona, etc) that tourists and things like Airbnb are having on the lives of locals so it’s definitely a touchy subject these days. If you are planning to stay in hotels, you will find budget hotels and luxury hotels in most cities and towns. You’ll find brand names you know from home but you will also find local places that you should try and stay in for a bit of local flair! If you want to get started looking, check here for hotels in Europe. Hostels are another great option to meet people and keep costs down. Contrary to popular belief, hostels are NOT just massive dorm rooms that are unsafe, dirty, and full of sketchy people. These days, hostels are a great way to meet other travellers in great, modern – sometimes even boutique – facilities. Private rooms in hostels allow you to get a room to yourself (if you choose) while still allowing you to meet people and get local knowledge from staff members. In fact, sometimes the private rooms and facilities in some hostels are better than the cheap hotels in the same city.. but people think “hotel” and think it’s obviously better quality. That’s just not a fair assumption! We’ve stayed in over 27 hostels across over 20 countries in Europe and literally only had positive experiences. So, if you’re a first time Europe tripper, look to hostels to make friends, gain confidence, and get out there to explore! To get started planning, you check now for hostels in Europe. Our advice is to always book in advance if you know your trip dates because the best places in popular cities DO book up. It’s no secret that there are dozens of languages spoken across Europe. Each country usually has an official language which is different from the one beside it. While English is spoken in most countries – and used in the service/tourism industry – you may not always be able to use English outside some big city centres. It’s always respectably (and useful) to learn a few words in the language of the country you are travelling to. Things like “hello”, “please”, “thank you” and asking for things are practical – and locals almost always appreciate the effort to speak their language. We’ve had to learn words in many countries from Romanian to Spanish, French, Dutch, and Danish. If you want to learn words, check out apps like Duolingo. Others like Google Translate can help you “on the fly” if you need help with a menu, a map, street signs, or otherwise. We wrote a whole guide on some great travel apps that we love if you want to know more! 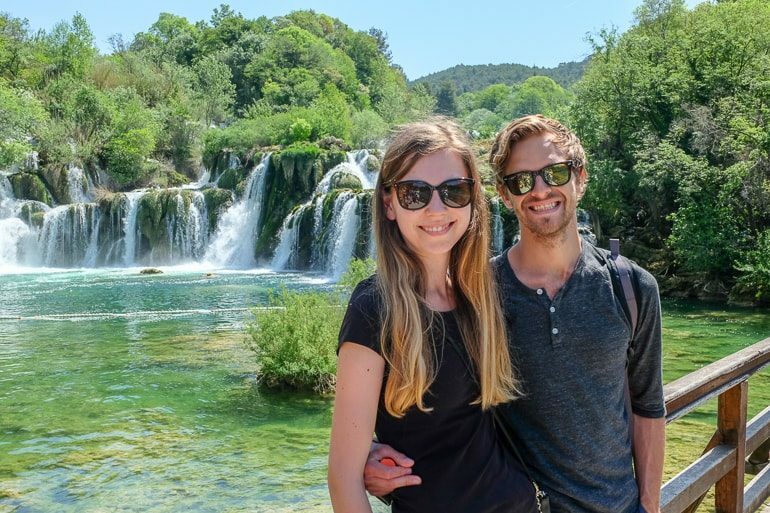 Us staying safe in Krka National Park in Croatia! Generally, Europe is a safe and stable continent. While there are exceptions, these are places you likely won’t be heading to on a first trip. As with most larger city centres that are common stops for tourists, pick-pocketing does occur. It’s important to watch your belongings at train/bus stations, on walking tours, etc. If you can, consider leaving valuables at the hotel or locked away in the hostel safe when you explore the city and especially when you go out at night. Only take the minimum (like ID, cash, and key) if you are unfamiliar with a city. As for staying healthy, have travel medical insurance for your trip that coves you in the countries you are going to. European countries have good or excellent healthcare facilities so you should be in good hands if anything goes wrong while you are travelling. There are loads of things you can do to stay safe and healthy though. In the summer, it can get super hot in the south (Croatia, Italy, etc) so, make sure to wear sunscreen, drink enough water and even wear a hat. Buy one if you don’t have one. We always have our water bottles topped up and fill them whenever we can. Usually, tap water is safe to drink but if you are unsure, ask your host or hotel! In the winter, make your sure have a good, warm jacket, warm boots with a good tread if you are hiking/on snow, and accessories like a hat, gloves, and a scarf is never a bad idea. Better to have it than not! 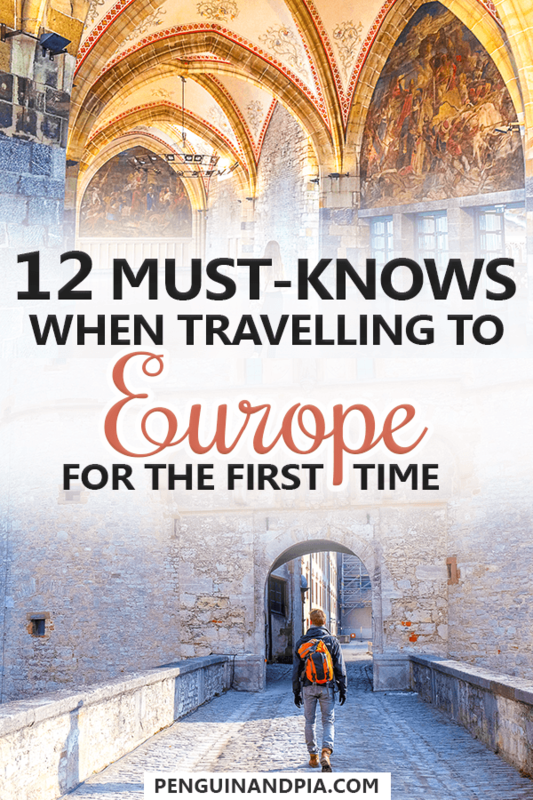 And there you have it – 12 must-knows before you travel to Europe for the first time! These are the things that we think are important to know. Obviously, we didn’t cover anything – but we hope this is helpful to get you started with planning your first Europe trip. In the end, you can only prepare so much. You have to live it to know how you travel, what you like/dislike on the road, etc. It’s a learning process for everyone – but WOW is it worth it! So, stay safe, have fun, and let us know how your Europe trip goes – we’d love to share tips/advice! 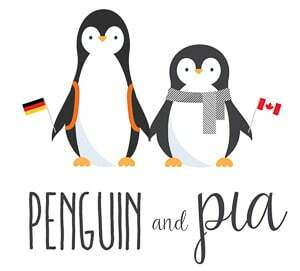 As always, Happy Europe Waddling!